Preparation time: 45 minutes plus approx. 1 1/2 hour cooking time. Mix the herbs with the garlic and 3 tbsp. olive oil. Season lamb with salt and pepper; rub all over with herbs and garlic. Refrigerate 2 hours. In the meantime, peel the shallots and potatoes. Cut in half and season with salt and pepper. Rinse the beans; cut the zucchini into slices. Preheat the oven to 140ºC/285ºF. 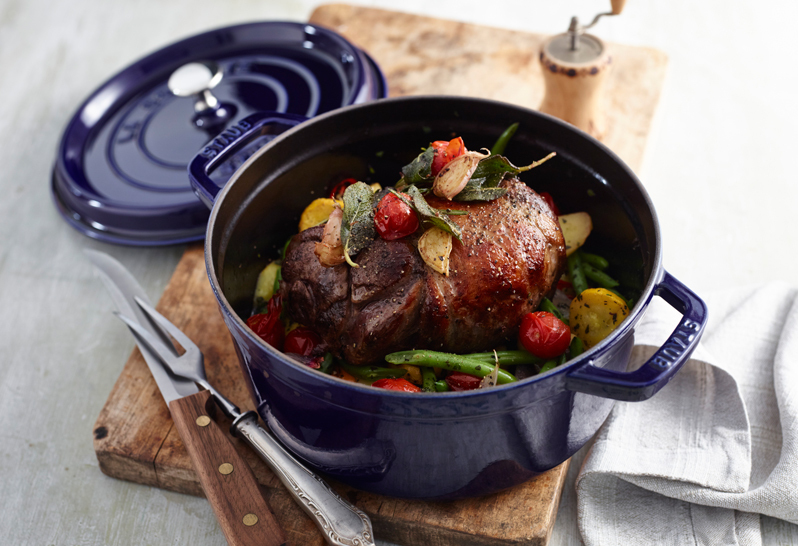 Take lamb out of the refrigerator and brown (herbs and all) in the cast-iron cocotte. Remove lamb from cocotte; add shallots and potatoes and sauté briefly. Lay the lamb on top and roast for approx. 45 minutes. Pour in the stock and add the beans, zucchini and tomatoes to the cocotte; cover and cook for another 30 min. Allow the lamb to rest for about 5 mins. before cutting. Distribute onto plates along with the vegetables and serve.